This weekend I got to enjoy the company of 40-some Quakers in upstate New York for the 2010 Brooklyn Quaker Meeting Retreat, which I helped organize. It was one of those times that reaffirm everything that I love about Quakers as a community. The locale was the historic and quaint retreat center called Powell House near Old Chatham, New York, about three hours drive north of New York City. Set amidst a hilly forest, with a nearby pond, campgrounds, and bird sanctuary, Powell House is a great setting for getting away from the city for a weekend. We managed to cram the place with Brooklyn Quakers in every bedroom, with a dozen or so camping nearby in tents. It was quite the intergenerational gathering with babies, youngsters, young adults and elders all mingling together over the three days. One of our main goals as an organizing committee was making sure that there was a good mix of programmed activity and free time for socializing and relaxation. I would say that if we erred, we erred on the site of relaxation, with ample opportunities for napping, taking a nature walk or just sitting in a corner and chatting with a friend or three. But we also had a great assortment of programmed activities, including worship sharing circles, a spiritual healing workshop, writing exercises, yoga, tai chi, and group hikes. I really enjoyed the hike up to Dorson's Rock with a dozen or so Friends, which has gorgeous views of the surrounding area. A highlight of the weekend for me was the bonfire on Saturday night. 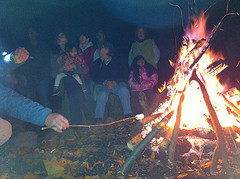 The children and adults alike shared the simple pleasures of making s'mores on the campfire. As the evening wore on, we told stories and jokes and sung songs from Quaker hymns to the Supremes and Joni Mitchell. Just watching the campfire glow, hearing the sparks crackle, leaning against a friend was just so calming and transporting for me. We all hushed as a flock of geese flew overhead, their honking in the distance growing closer and closer until they had passed. Beyond the scheduled activities, some of the best times at the retreat for me were the unplanned encounters I had with nearly every person at the retreat. I learned from a lovely older couple how they first met at 15th Street Meeting. (“The first thing she asked me was, 'So what's up with your hair? '”) I got into an involved and meandering conversation with several Friends about intellectual property and creative expression. 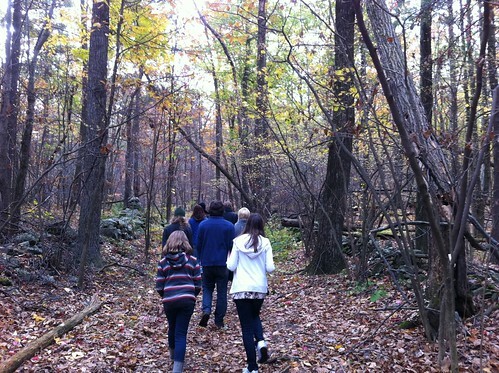 On the hike, several of us invented an alternative narrative for the retreat as an epic test of courage and valor to determine who would be the next clerk of the Meeting, with the finalists having to battle the current clerk on the final day. While it was mostly light and silly conversation, it made me feel closer to several people that I didn't know very well. As the clerk of the retreat committee, my goal was a simple one: create a friendly space and a flexible structure for the attendees to share their ideas, concerns, spirits, and hopes with each other. Watching people step up and volunteer their talents, time and experiences with the group was great to see. Coming back from the experience of organizing the retreat, it inspires me to trust people more and worry less. People by and large enjoy sharing their gifts, they want to feel useful, they like being asked what they would like to lead. I need to remember that.